The EIPL, heavy duty DF5000, High Velocity Fan, has been specifically designed for the hire industry. With a rugged construction the DF5000 is the ideal choice for the hire fleet manager. Like all hire shop equipment, the DF5000 is built to the rigorous hire industry standards. Its robust welded steel construction guarantees exceptional rapid payback and many years of revenue generating service. This popular and versatile air mover, can easily be moved to any location where cooling or improved ventilation is required. Its adjustable head allows the air to be directed to specific areas, thereby making it the ideal choice for factories, garages, warehouses etc, where natural air movement is inadequate. The quiet operation of the DF5000 makes it ideal for use within occupied environments and could also be used as a man cooler. The DF5000 is a robust unit consisting of a tubular stand, heavy guage steel casing and finger guard, which are finished in a durable epoxy power coating. The tubular chassis forms a handle to make maneuvering easy and direct, while the drum handle and locking hand wheel ensure a quick and easy setup, with the confidence the drum will not move from its deployed position. 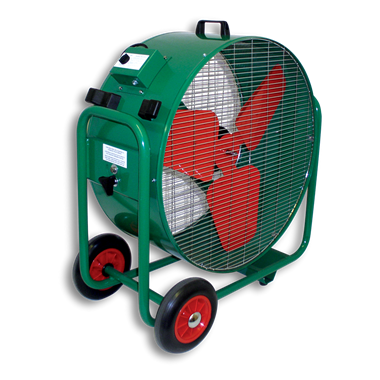 A carefully balanced three bladed fan rotates at the ideal speed to ensure the unit is quiet, and equally important, delivers a high velocity of air. Three speeds are available via the control panel rotary switch. The DF5000 is supplied with a 230V power lead and BS approved three pin plug, with the facility to wrap the power cord while the equipment is in storage.